The AL language has an object type called ‘enum’. This object type defines a list of possible values in the form of a set of key/value pairs, plus captions. 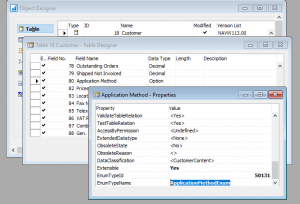 You can then create a field in a table or table extension enum as its data type, and the field will provide the user with a drop down list of those values. Just like option fields, the database stores the numerical values of the enum in the field. 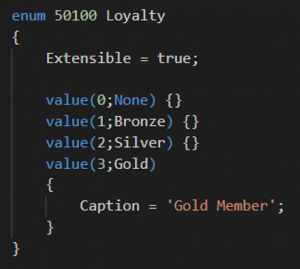 Note that the ‘Extensible’ property is set to true, so it will be possible to extend the enum with additional options when the enum is used in other extensions. Now, in order for this enum to be extended, you would have the app that includes the enum as a dependency (which puts the original enum into the current app’s symbol references), and then you would create a new object called an ‘enumextension’, in which you define additional values. 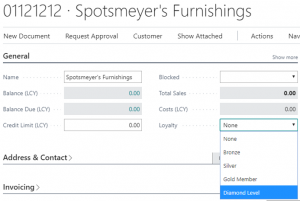 When I learned about the extensible enum type, I was salivating at the thought that it would be possible to extend the available options in a ton of tables (type in sales/purchase line, account type in journals, entry type in ledgers to name just a few of them). It IS possible to do just that, and eventually the goal is to replace all option type fields in Business Central with enum type fields, it’s just that it comes with a crap ton of refactoring of existing code. There is a lot of code that checks for all available option values, with an ELSE leg in the CASE statement for ‘other values’. All of that code will need to be refactored to allow for extended enums instead of just raising an error with an unrecognized value. Now you know about enums, start using them instead of option type fields, and make them as extensible as possible.